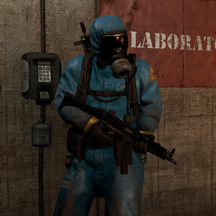 The Military Tunnel Scientist is very powerful, often wielding military grade weapons, such as a LR-300 or a MP5. They occasionally drop high grade, but rare weapons such as the M92 or SPAS-12. They are spotted around the unique Military Tunnel monument and do not roam it alone. They are better geared than other Scientist NPC's. When you fight the scientists, do NOT get close to them. They have a lot of damage but bad range. Keep your distance, use a bolty, SAR or any weapon with decent range to effectively kill them. The scientists, as stated above, are equipped with high-quality, high-damage weapons. Their aim at a distance is quite bad, but their aim at close range is exceptional. Do NOT get close to them. A good trick I realized is making F1 Grenades, and whenever you hear them, throw one at them. Grenades have had a lethality boost, so it will only take 1 grenade and maybe a bullet or two to finish them. Okay i found out something interesting here the other day, I got up close by a mistake with a scientist with a Spas12, paniced like hell drew my sword and started hitting like a crazy, and to my suprise he put his gun away and drew a sword himself and it saved me cuse they seem to be super bad as melee fights. Also 2x HS with a crossbow with normal arrows is a kill. or at some spots in the tunnels they seem to often me "stuck" in place so u could bring fire arrows and quickpeek them and burn em up. These guys have low damage output at distance and also a weak point in close range soo let me tell you if you want to safe and play 15 minutes to loot military tunnels or agressive in about 7 minutes. scientists have a breif period of time before they acctually shoot you. they dont always have their gun out so take advantage of the time you have before they pull their gun out and try to kill them then. if you are good with a python you can kill them super easily before they even pull out their gun. 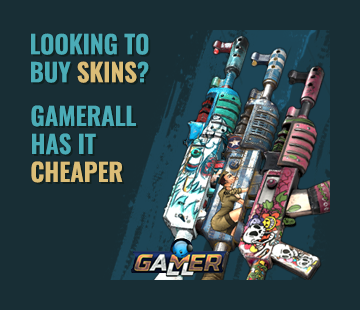 this also works with the new puzzle with killing the scientists behind the door if you have a partner with a double barrel or a python you can generally kill them without them shooting back.